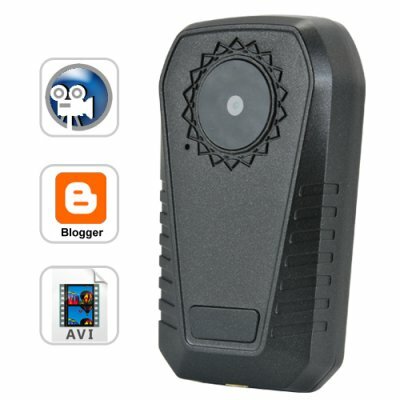 Successfully Added Videoclipper - Handsfree Mini Video Camera (Clip-on) to your Shopping Cart. Like the iPod Shuffle, you can clip The Videoclipper on your shirt or your belt so your hands are free to do other things. Although a clip may not seem like much, this one little feature made the iPod Shuffle one of the best selling mp3 players ever, and we think it's going to do the same for The Videoclipper. If you're a reseller, The Videoclipper is going to be your next big earner! Stock up now! The Videoclipper is also very easy to use. How easy? True one button operation. Yes this unit only has one button on it. Press the button to power it up and start recording. Press the button again to power it off and save recording. That's it! *A word about life blogging. More and more we're seeing individuals who are interesting in capturing their entire lives on video. The Videoclipper is a life bloggers' best friend because its battery lasts up to 5 hours. What's more, throw in a microSDHC card (it supports up to 16 GB) and you can capture everyone you meet and everything you do throughout your day, then download it when you get home that night. The best thing about The Videoclipper is the price. With its clip and its sub-$50 price tag, The Videoclipper is poised to be the perfect resale item. Get one today to see how great this camcorder is, then order in bulk to enjoy per item and shipping savings. Put it on eBay, and we'll even dropship it straight to your customer's door! Chinavasion - your best source for high quality, low priced gadgets. There is only one button on the unit. Press the button once to power the unit on and begin recording. Press the button again to power the unit off and save the recording. It's so simple, your mom or grandmother can use it. How do I retrieve the videos I've created? Attach the unit to your PC computer using the USB cable. A folder will appear inside of which are videos you've created. I don't blog! I'm too busy as VP of Sales at my company to blog. So why the heck would I need The Videoclipper? OK, picture this. You're at a sales conference. Thousands of attendees. You walk around shmoozing and introducing yourself. How many names to faces can you remember at the end of the day? At the end of the weekend? Let The Videoclipper be your personal secretary. Disconnect the USB. The camera will read the file, change the camera date time, and delete the file.